The poll bugle for Uttar Pradesh has been sounded. All the major political parties in the fray — the Congress, Bharatiya Janata Party (BJP), Samajwadi Party (SP), Bahujan Samaj Party (BSP) — have started campaigning with full gusto. There is the usual heat and dust and animated rhetoric which is principal to any elections. But any national party worth its salt in India knows the importance of Uttar Pradesh. As the old political saying goes, the road to Raisina Hill takes a detour via Lucknow. Hence, it becomes crucially important for the parties to pick, choose and expound on the issues that will resonate most with voters. The outcome of the Uttar Pradesh elections has a significant share in the performance of the government at the Centre. UP, which has the highest percentage of Muslims, is a massive deal for parties who often use religion as a pawn during elections. A win in UP would basically propel the victorious party’s fate in the Lok Sabha elections in 2019. At a time when communal sensitivities are stoked often just for political gains (and UP being a hotbed for such activities), Ayodhya and Ram Janmabhoomi are emerging as crucial poll tools for many parties. Political pundits have asserted that while Kairana and Mathura will be vital for a win in the state, bringing up Ayodhya could also affect the dynamics hugely in the state. 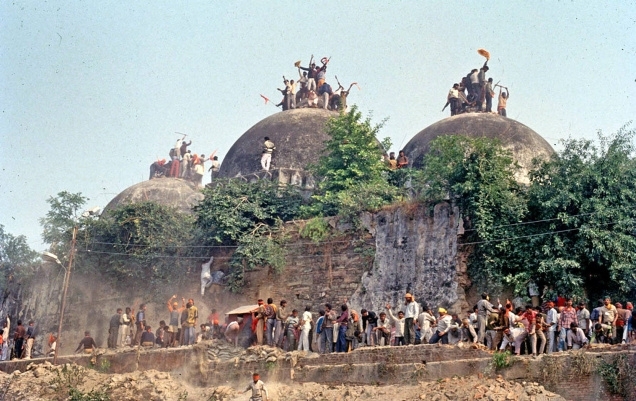 Ayodhya remains a sensitive issue for many and by raking it up, parties might end up losing either core Muslim or Hindu votes in the state. The disputed site, now ringed with guard towers and troops, is in Uttar Pradesh. The setting of elections early next year could make or break prime minister Narendra Modi’s chances of gaining control of the Rajya Sabha. An upper hand in Upper House would help the prime minister push through his economic reform agenda, which firebrands within his religious base do not always agree with. Let’s analyse how Ayodhya, as an issue, is back on the menu for parties and how each party might gain or lose from it. AYODHYA and the creation of a temple at the Ram Janmabhoomi has been the party’s plan since the BJP took shape as a political party in 1980. And as campaigning has started to gain dust in the state, UP BJP leaders think the time is apt for Modi to build the famed Ram temple. “For how long will Ram Lalla be covered with tarpaulin?” Vinay Katiyar, founder-president of Bajrang Dal and a pro-temple voice, told senior editor of News 18 Bhupendra Chaubey. Even though the issue remains sub-judice in the Supreme Court, BJP leaders think the central leadership should at least let the people know that a temple construction is in the offing. “The time is right for the construction of a Ram temple. A mosque should also be constructed simultaneously. Both sides are ready, a little bit of initiative from the government will ensure that both temple and mosque are constructed,” C P Thakur, BJP’s Rajya Sabha MP, told India Today. In fact, a few senior party leaders from Uttar Pradesh feel that taking a hardliner stand on issues like Ayodhya can take BJP a long way — a higher percentage of votes just like Modi garnered during 2014 Lok Sabha Elections. Ayodhya is becoming a defining test of Modi’s ability to navigate a tension central to his administration: appeasing Hindu nationalist activists who corral votes for the ruling BJP while preventing them from derailing his pro-business growth agenda. Modi’s success or failure will go a long way to defining his legacy. The BJP’s ideological fountainhead, the Rashtriya Swayamsevak Sangh (RSS), lobbied for a Rajya Sabha seat this April for Subramanian Swamy. Less than two weeks later, Swamy informed Parliament that he had a point of order to raise. Amid cries of disbelief, he rose from his seat and voiced frustration that the nation’s attorney general had not done more to get a court verdict on the temple in Ayodhya. Even though the prime minister’s tag line – development remains the top priority – is toed in by most of the party members, it is not clear if that will satisfy Modi’s doctrinal base in the run up to the state ballot. PARTY vice president Rahul Gandhi made headlines when the Congress announced that the party second-in-command will visit Ayodhya. The visit was part of Rahul’s Kisan Yatra. Rahul became the first member of the Gandhi family, since his father Rajiv Gandhi, to visit the temple town since the Babri Masjid’s demolition in 1992. Earlier this month, Rahul began the fifth day of his Kisan Yatra by offering prayers at Hanuman Garhi temple in Ayodhya. As a report in The New Indian Express says, this was Congress playing the ‘soft-Hindutva’ pitch in a state which is already polarised on communal lines. Poll pundits have predicted a bleak result for the Congress in UP (based on its past performances). However, they also asserted that Congress’ aim may not be to win UP, but with an eye on 2019 polls, the party aims at denting BJP’s chances. The Congress has been traditionally wooing Brahmins but with the emergence of the BJP and BSP, the chunk shifted. This time the Brahmin vote was expected to be divided between the BJP and BSP with BJP getting the biggest share. But Congress has made it a point to single-handedly pursue its core vote bank. Rahul visiting Hanuman Garhi was significant, the party said, as father Rajiv in 1990 during his Sadbhavna Yatra had skipped the temple. Rahul plans to start from where his father left Ayodhya 26 years ago, the party leader said. However, he too skipped a visit to the Ram temple. Visiting the temple could have ruined the main agenda behind the Congress’ Kisan Yatra and turned it into a Muslim-Hindu issue. Congress would not want to antagonise the Muslims, who form at least 18 per cent of the state’s population.